A political decision in early 1915 that the British war dead were not to be transported home determined the location and design of War Cemeteries on the battlefields and War Memorials in Great Britain. The subsequent loss of life was on an unprecedented scale. Every community in the country was affected by the war. Many men were buried or commemorated in places then almost inaccessible to the bereaved. Their loved ones’ absence from ‘home’ accentuated the grief. After the war there was a deep need to provide a focus for individual and public mourning. The personal and public desire for a tangible symbol of mourning of the community dead of the greatest national calamity ever known resulted in the War Memorials one sees in every city, town and village in the country. The memorials were designed and built out of strong feeling of pride and sorrow. It was considered important that they were seen as living memorials – that is, as the focus of remembrance services, to impress on present and future generations the sacrifices and human cost of war. The area that is now Hyndburn more than followed those principles. A few townships chose the Cross, the symbol of hope born out of suffering; others, female figures symbolising faith or victory or peace. The most simple memorial style is the obelisk – an ancient form of commemoration of the dead. It acts as a landmark and can also be enhanced by symbolic figures. 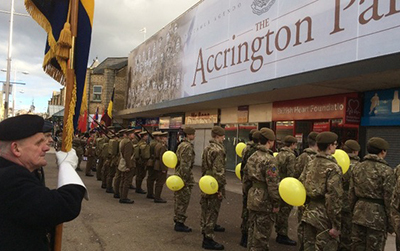 Accrington’s is perhaps one of the most impressive in the country. Baxenden chose a memorial cross. The cross of ornate design is just inside the entrance to St. John the Baptist churchyard off Manchester Road. The base is of Cornish granite. The octagonal base and pedestal stands atop five steps. The shaft and cross is a solid piece of granite. On the pedestal facing the church is the inscription “This memorial was erected by public subscription to the glory of God and in memory of our Baxenden lads who gave their lives for us in the Great War 1914-1918. Greater love hath no man than this.” On the reverse, facing passers-by, is “In Memory of our Baxenden lads”. Thirty six names are inset in lead on the pedestal base. The designer was Mr. W. J. Newton, Accrington’s Borough Surveyor. The cost was £450. Although the memorial is in St. John’s churchyard, it is in no sense a denominational memorial, but representative of all who lived within the bounds of what was the old ecclesiastical parish. The unveiling ceremony took place on November 13th 1920. Before the ceremony a joint service was held in the church by the Vicar, the Reverend W. Walker, assisted by the Rural Dean, Canon Downham, and the Reverend R. W. Hasler, minister of Baxenden Wesleyan Mission church. Special hymns were sung by the joint choirs of St. John’s and Baxenden Wesleyan Mission. The memorial was unveiled by Sir George Bullough, a local industrialist, and, in his own words, ‘a Baxenden lad’. The ceremony, made more poignant by ceaselessly pouring rain, ended with, unusually for an English village, the playing of the Scottish funeral dirge ‘The Flowers of the Forest’ by Pipe Major McDonald of the Accrington Pipe Band.